Up until a year ago, I was someone who was not big into formal exercising and wasn't much into getting sweaty. As a result, at age 69, I was experiencing pain in my knees, back and sciatic nerves. One year later, and I have never felt better! I first met with Jack in November 2016 and shared my goal of fitting into a pair of the most amazing Liverpool jeans that I had in my closet. I purchased these jeans even though they were a size too small, vowing that one day I would wear them comfortably. Today, I'm wearing those jeans very comfortably! Thanks to Jack and Michelle for the encouragement! "I was lucky. I had to get 5 stents. It took 3 hours on the operating table but I had excellent results. The surgeon said he was sure glad I was working out. I am sure it made the difference. Thanks to you guys." It has been a pleasure working with Michelle for the last four months, following a wrist fracture that required 2 surgeries and was combined with a frozen shoulder. The strength and mobility in those areas has improved dramatically, with Michelle's assistance. I have seen my mother's health and mobility decline over the years and I felt that I needed to make some changes to avoid the same fate later in life. I wasn't looking to become a "hard body" and I didn't want to train with a trainer at a gym half my age. I have worked with Jack for just over a year now and I have to say I have gained so many more benefits than I ever expected to. Achieved weight loss, no more sore knees, fatty liver disease gone! Michelle is the most amazing trainer I have ever known! I have been training with her for the last 7 years; originally I started training with her to shed unwanted pounds before my wedding. Then, I was hooked! Even after all the time we have spent together, she still comes up with exciting new exercises for me to do. Exercise to achieve YOUR goals. Not a magazine cover. Our fitness studio is separate from our home on site and has a change room for clients with hangers and hooks and chairs to stash your bags. Our studio has a high ceiling and is bright and well-lit, even in winter months. Our heated/air-conditioned studio has a commercial rubber floor, with a 6 foot wide strip of carpet for slider work. We have step benches and risers for any bench work and balance equipment, with a variety of sizes of exercise balls. We have a large range of dumbbells and kettlebells. We have a good selection of foam rollers as well to help loosen tight spots. Also, we have a selection of smaller fitness tools that we use from time to time such as small balls, ankle weights, belts, pulldown bars and o-tubing of different sizes. We believe that fitness needs to help you function in life day to day. Is specifically chosen to not only help you function better at home, but even so you can work out at home! Everyone should be able to do their work out at home. Otherwise, it's not functional. Our business name of “ageless” was inspired by our father, Denis. To us, he is the epitome of an ageless person, in both body, spirit and in his positive attitude toward life. Our father was our first client and he has improved his fitness level to a degree that defies his actual current chronological age of 84. We are a high-energy husband and wife team of high-ranking retired Masters athletes. Jack is 66 and Michelle is 61. 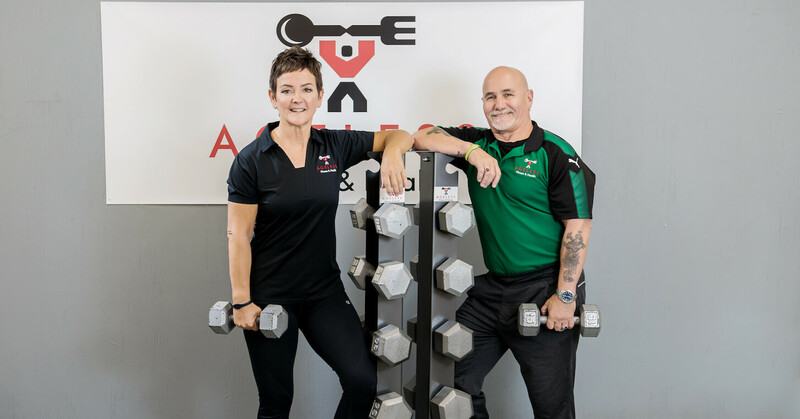 Prior to attaining our fitness and nutrition certifications, we had been strength and resistance training to gain lean muscle for 4 decades each. Today, we are dedicated to helping our clients achieve better health and wellness through proper exercise and nutrition. Please leave us an email in the form at the right OR contact Michelle at 780-909-0616 for more information about our services.